Better buy for a food bank? The powder makes 34 portions, the instant just four. You would think buying food for a food bank would be easy. You’d be wrong. First rule: buy what users of food banks need. Not what you think they need. I’ve heard many food banks are inundated with fusilli shapes, pulses, baked beans, chocolate digestives and cornflakes but short of meat and fish to eat with all those carbs. Off to the supermarket then. First, UHT milk. It excites me so little as a product that my brain skips directly to Item No. 2. Sorry about that. Fruit juice. Here we go – my first moral judgement about what poor people should be feeding their children. Would I feed my children fruit juice if I was struggling to feed the gas meter? All it does is ruin their teeth and pump a quick injection of acid and sugar into their stomach. What’s wrong with water or milk? Next up, the long-life sponge pudding. I have a good look round Sainsbury’s. 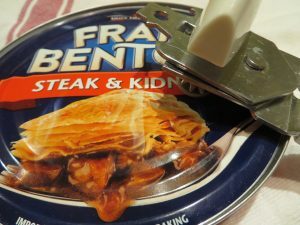 The kind I’m looking for is made by Heinz – chocolate sponge that comes in a tin which you boil in a saucepan. Saw one like this in my 90 year-old father-in-law’s pantry. It is Comfort Food Central and I get a warm feeling inside thinking of that homeless ex-soldier with PTSD tucking in or those children I saw in the film I, Daniel Blake. They will be licking their plates especially if it’s served with hot, sweet, yellow custard. I cannot find tinned sponge pud. What I do find are rather joyless instant puds which you microwave. At £1.70 for two tiny ones, they seem expensive. But then I am a cook. Item no 4. I ditch the sponge pud idea and start looking at custard. It comes in many forms: tinned, Tetra pack carton, powder. I grab Tetra packs of Sainsbury’s own label which are better value than Ambrosia. Later I notice that the label on the pack contains the word Lighter. Darn. Hungry people need calories, not sweet treats aimed at slimmers. When I return to swap it, a middle-aged man on a mobility scooter is blocking most of the custard section so we browse together. 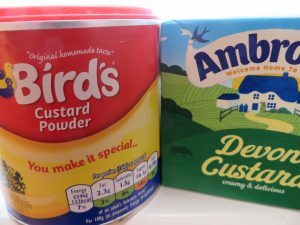 The best value custard is in a 300g Bird’s tub. You can make 34 portions for the same price as a 500g pack of ready-made which makes only four servings. The question is: do users of food banks have kitchens? And would a younger cook know how to mix custard powder with sugar and cold milk then combine with hot milk? For that matter, do they have cooking skills, herbs, spices and blenders so they can do clever things with all the kidney beans, chick peas and lentils they’re getting? In the end, my new friend, Scooterman, and I buy custard powder in 40p sachets, me guessing that most of the food bank’s clients, like Scooterman, live alone. Plus we can give more people custard if we buy in smaller units. I forget the toothbrushes and buy several Mum roll-on deodorants which are on special. I also buy tinned pork luncheon meat, thinking later this may be politically incorrect; some food bank users may not eat pork. how emotional charitable giving is. We hate to think of children missing out on chocolate advent calendars but do we care if their mum misses breakfast to feed them in January? This is why I buy the deodorants. They are for the single mum who can’t afford toiletries but who wants to smell nice at her job. should we donate any foods we wouldn’t happily eat ourselves. Interesting discussion here. Could we feed people more nutritiously, effectively and cheaply if we just opened an old-fashioned soup kitchen instead of a food bank? Or would they lose all their dignity and independence? Should food banks offer cooking lessons or is that a patronising middle-class person’s thought? A small donation to the food bank gives me much food for thought. Have you ever donated to a food bank and if so, what and why? Are food banks wrong to ask for bags of sugar? No doubt some might say “those poor people who use food banks deserve any treat they can get”. But how much of a “treat” is tooth decay or constipation caused by a nutrient-poor diet?